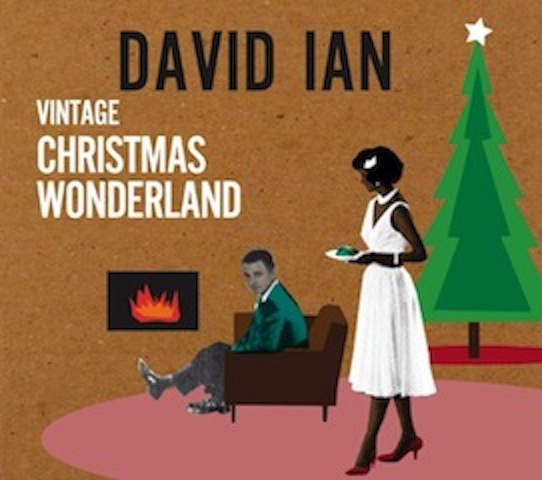 As a followup to his acclaimed 2011 Vintage Christmas full-length album, jazz pianist-guitarist-arranger David Ian follows a similar template with much the same cast, pares the set list down to five tunes--three sacred, two secular--and comes up with an unqualified gem. AUDIO CLIP: ‘Angels We Have Heard on High,’ David Ian; lead vocal, Acacia. From Vintage Christmas Wonderland. Working with Jon Estes on upright bass and Josh Hunt on drums and percussion, with Elizabeth Estes contributing violin and cello, Ian opens Vintage Christmas with a dreamy classic American pop treatment of “Angels We Have Heard on High,” with vocalist Acacia completely reframing the song in torch terms (including an affecting but discrete use of strings) with her whisper-soft, dreamy vocal, a bravura performance that tops her dazzling, emotionally complex treatment of "Have Yourself a Merry Little Christmas" (she sounded like she might have been singing to someone who had ticked her off even as she cherished the season’s familial warmth) on Vintage Christmas. Andre Miguel Mayo, who brought a bluesy breeziness to “Let It Snow! Let It Snow! Let It Snow!” on the 2011 disc, returns here, also ably complemented by a bright string arrangement complementing the trio’s gentle swing and the soothing Andrews Sisters-like background vocals by the sister duo Tai and Acacia, with a cheery, easygoing “Winter Wonderland” in a performance that emanates cool. All of these vocalists then return at the EP’s close, with Tai and Acacia fashioning silky sibling backgrounds to Mayo’s swinging rendition of “Jingle Bells,” in a finger-snapping, lively piano-based arrangement. AUDIO CLIP: ‘The First Noel,’ David Ian, piano; John Estes, upright bass; Josh Hunt, drums and percussion; Elizabeth Estes, cello. From Vintage Christmas Wonderland. Rounding out the disc are instrumental versions of “O Little Town of Bethlehem” and “The First Noel” featuring Ian’s piano front and center. Of course when you get into piano-based Christmas music, especially of a gentle nature, the late, great Vince Guaraldi’s work immediately springs to mind. Indeed, Ian’s improvisational variations on the melody and rhythmic digressions on “O Little Town of Bethlehem” recall Guaraldi’s deeply personal explorations of “What Child Is This” and “Greensleeves.” “The First Noel” is the more straightforward interpretation of the two, hewing close--but not without some detours, mind you--to the affecting melody while adding room for Estes to give the upright bass a frisky solo workout and deploying the cello selectively for haunting atmospherics. At 16 minutes in length Vintage Christmas goes by fast, but oh, how its effect lingers on. It’s not vintage; it’s timeless.